In the culinary books there are recipes that are suitable for absolutely any life event. Whether it's New Year, birthday, unexpected guests or an ordinary family dinner. This is the recipe for salad with beans and croutons. It is easy to prepare, on the table attracts attention and causes a desire to try. It is associated with one of the useful culinary tips - always keep a jar of canned beans in reserve, and then any sudden guest can be found fully armed. «Неожиданный гость» 2.3 "Unexpected guest"
«Сладкая жизнь» 2.6 "Sweet Life"
«Теплый диетический» 2.9 "Warm Dietary"
Salad with beans and croutons is a delicious, satisfying and healthy dish. For its preparation different types of beans are suitable: white, red, spotted, boiled, canned or chipped. This salad is very nutritious, rich in proteins, vitamins. Valuable properties of beans are so many that nutritionists deservedly ranked it among the ten most healthy products. Do not abuse beans to elderly people, and if there are problems such as gastritis, ulcer, colitis. It is forbidden to eat raw beans, since without heat treatment it can cause poisoning. For culinary purposes, the bean is cooked in the usual way or steamed, baked, marinated, added to salads, omelets, stew, soups, vegetables, lamb, chicken or fish. According to the grades, it is divided into soft and green beans (pods). With what beans to prepare a salad (boiled or canned), depends on personal preferences. Pay attention to some features of each kind.
. White . It has a delicate, creamy taste. Has a crumbly structure. Caloric content is 102 kcal per 100 g.
. Red . Of all species, it is most saturated with nutrients. Judging by the reviews, many prefer it: in the salads looks "smart", and its more solid structure is not afraid of stirring. The energy value is 97 kcal per 100 g.
. Canned . Ideal for a winter diet. Has a calorie content of 215 to 230 kcal per 100 g of product. After preservation preserves up to 80% of useful properties, however, preservatives, flavoring agents are added to it. It is better to buy in a glass jar. Before use, rinse with running water through a colander.
. The pod . The lowest calorie of all varieties and has dietary properties (31 kcal per 100 g). It is mainly sold frozen. Of course, the most convenient option to use canned beans, because all other varieties must first be boiled. Do this the right way to help the following ten tips.
. To sort out . The shelf life of the bean is important. If the beans have been lying for more than two years, they have dried up and are unlikely to please you with good taste. They need to be sorted out and get rid of wrinkled and dubious beans, as well as dry stems and other debris.
. Soak it . Before cooking, the beans in a proportion of 1: 5 are flooded with water for at least six to ten hours, several times the water is changed. 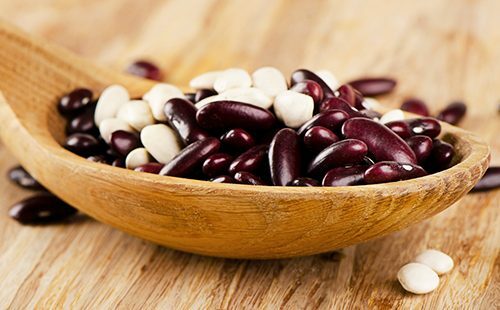 This is necessary for the disappearance of antinutrients from the beans - compounds that complicate the assimilation of useful substances, as well as to partially dissolve oligosaccharides, causing increased gas formation in the stomach. Among other things, pre-soaking shortens the cooking time of beans, making it more airy.
. Choose dishes . The volume of beans after soaking and cooking will increase by two or three times, so immediately it is worth choosing a saucepan more.
. Replace the water . To make the beans tastier, as soon as it boils, drain the water, gain a new cold and continue to cook further.
. Add the oil . Added to the boiling water a tablespoon of ordinary sunflower or olive oil will reduce foaming.
. Do not interfere . During cooking, the beans do not interfere, otherwise the result may be "porridge-malash".
. Do not salt . In the process of cooking, the beans are not salted. Add salt five to ten minutes before the end of cooking.
. Do not cover . Beans are cooked without a lid in an open dish.
. Keep track of time . The average duration of cooking is 50-60 minutes. If the beans do not soak, the duration of the procedure can increase to 2.5 hours. Smaller peas, as well as white beans, are boiled faster. Accelerated process added to the water a teaspoon of baking soda.
. Check the readiness . The restaurant method will help you - the "three system". To do this, from the pan, any three beans are extracted and taste them. If all three are soft, you can not doubt - the product is ready, and if at least one of them is firm - you need to cook further. These recommendations relate to cracking varieties. Green beans do not need to be soaked before cooking and cook for a long time. In fresh form it is prepared in just five to seven minutes, and frozen enough 10-15 minutes after boiling. Want to play with the flavors, add to the interesting crunchy texture of the salad more aggressive or on the contrary, soft notes? Then experiment, do not get hung up on simple recipes, choose additional ingredients by your own taste. In the bean salad with crackers can be meat, sausage, seafood, vegetables, mushrooms, cheese, garlic, pineapples and grapes. As a dressing, you can use mayonnaise, soy sauce, olive oil with garlic. Also, aromatic herbs and spices will be appropriate: the bean is well combined with black and fragrant pepper, cumin, cloves, chili, nutmeg. As for crackers, it is better to make them yourself, drying in the oven or on a dry frying pan small squares of plain white or black bread (you can slightly podsolit). So you get a crunchy ingredient without the harmful artificial flavor additives that shopkeepers sin. Step-by-step salad recipe with beans and crackers contains one important item. The main culinary function of crackers is to give the salad a spicy crunch, so they are added to the dish just before serving. Otherwise they will soften and turn into an unappetizing mash.
. Feature . The classic salad recipe with beans and crackers has a delicate taste with a pleasant crunchiness. In the classic recipe salad is fast, hearty, appetizing. And the lack of sausage and meat in the platter makes it to the same budget. mayonnaise - two or three tablespoons is enough. Dry the bread boxes or use the packaging of crackers (50 g). We put the beans and corn in a salad bowl, having drained the water from them. We fill both ingredients with mayonnaise and mix. Just before eating, we add crumbs to it. We decorate the chopped greens.
. Feature . This is really a five-minute recipe, convenient in the case when suddenly I wanted to "tasty". three to four tablespoons of mayonnaise. Put the beans in a colander, rinse. Marinated mushrooms cut into small pieces. Champignons are added to the beans. Cut the tomatoes into cubes, combine them with the rest of the ingredients. Before serving, add bread crumbs.
. Feature . The guests are already on the threshold? In the fridge, the careful housewife must have the most "running" products. And having in your arsenal this recipe of salad with beans, rusks and sausage, you will not allow yourself to take yourself by surprise. to decorate the feathers of spring onions, dill. We cut white bread or a loaf by squares, dried in a dry frying pan. We rub cheese on a large grater. Thin strips of chopped sausage. The canned ingredients from cans are put in a salad bowl. Mayonnaise is mixed with a pinch of salt and chopped garlic. Season this salad with a salad and gently mix. Before serving, lay out the remaining ingredient - crackers. The final touch is decorating a dish with chopped dill and onion feathers. Equal replacement of smoked products - ham. In combination with beans and cheese, it will give the salad no less vivid taste. And to diversify the recipe of salad with beans, with crackers and ham will help fried or marinated mushrooms, fresh vegetables: tomatoes, cucumbers, sweet peppers.
. Feature . The name of this dish is due to a piquant taste combination of apple and salted cucumber. If the egg is excluded from its composition, the salad is ideal for fasting days. Dry the crusts until golden brown. Hard-boiled eggs are cleaned, crushed. We clean and finely chop the onion, if desired, we will fill it with boiling water. Salted cucumbers and an apple cut into cubes. All components are mixed in a salad bowl. Season with oil, salt, add red pepper. In the last turn, in the bean salad, add crumbs, decorate with greens and immediately served on the table.
. Feature . Beans, nuts, greens are the basis of the Georgian diet. Salad "Tbiliso" is not just tasty, it is original and soulful. wine vinegar - a tablespoon. Half-rings of onions are placed for 30-60 seconds in hot water. Pepper is cut into thin strips. Cooked in advance beef fillet cut into cubes. Garlic is passed through a garlic press. Fry finely detailed nut kernels. We connect all the components. Pour olive oil mixed with wine vinegar. "Tbiliso" is served on the table, not forgetting to supplement the salad with croutons.
. Feature . 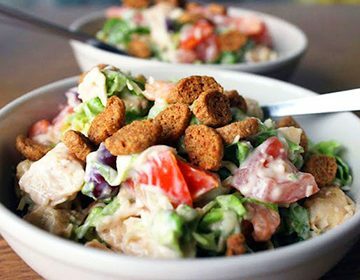 Prepare a salad with chicken, beans and croutons is not difficult: just need to mix these products with mayonnaise. But if you approach the culinary task creatively, you can make an extraordinary dish, the recipe of which you will immediately have to share with your friends. mayonnaise sauce - three to four tablespoons. Pre-cooked or baked breast cut into neat squares. Fry in a dry frying pan small pieces of Borodino bread. They should not be crunchy, but tough. Vinogradiny cut in half or circles into three parts. We do not cut an apple squarely, squares. In Mayonnaise squeezed garlic and season with this sauce a salad. 20 minutes before the meal, sprinkle with croutons and give them time to soak up the scents.
. Feature . The main components of the salad, which is prepared in 15 minutes, is beans, crab sticks and cheese. Dry the bread boxes in the oven. We cut crab sticks, we should have cubes. We cut the pepper, which has been peeled off the seeds, with a similar shape. We combine beans with ready-made ingredients. We cut small cubes of tomatoes. We connect everything, we squeeze garlic from the top. Add salt and cut greens. Season with mayonnaise and mix. Before you put on the table, on top of the dishes lay out crunches.
. Feature . At its core, it is a salad of white beans, Korean carrots and crackers. The listed products are basic. However, on this everyday basis, you can create a festive version, which can even surprise sophisticated gourmets with its taste balance. Previously, you need to boil beans and chicken. two or three tablespoons of mayonnaise. Slightly cut canned pineapple and boiled meat. Beans are combined with Korean carrots, chicken and pineapple. We add golden croutons only before serving. When you fill a dish, do not overdo it: the excess mayonnaise will not benefit this salad. Before serving, "Delight" should be for half an hour. Together with crackers in this original dish you can add pounded walnut, and boiled breast can be replaced with smoked chicken leg.
. Feature . In this low-calorie salad, beans and rusk bread crumbs are used. Despite its nutritional value, such a dish does not promote weight gain and the appearance of fat deposits on the sides. Let's dry two handfuls of crackers from black bread. We divide the boiled string bean with two-centimeter strips. Olive oil mixed with the juice of one lemon, add salt, black pepper and finely chopped herbs. To warm beans we attach tomato halves and sesame seeds. After dressing with sauce stir. Top with crunchy black breadcrumbs. 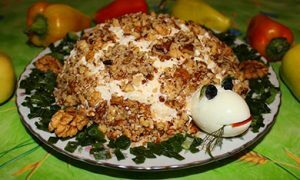 Any recipe for salad with beans and crackers without mayonnaise is already dietary. And find a replacement for mayonnaise is not difficult. Try to mix mustard with sour cream and lemon juice, sour cream with soy sauce, garlic and greens. A good dressing for beans salad - classic pesto sauce. Just a few interesting ways how to make a salad with beans and croutons will make it possible to diversify not only the everyday, but also the festive menu. And you can serve it not only as an independent dish, but also as a filling for pita bread, tartlets or sandwiches. However, this salad should be limited in the diet with a tendency to flatulence. Beans, like any legumes, provoke an increased accumulation of gases in the intestine. To prevent swelling, when cooking beans add water to the leaves of mint, thyme. By the way, the bean is so popular in England that the famous British biologist Colin Leakey has brought out her new variety, which does not cause flatulence at all. Thanks, I was just thinking about what kind of salad to cook for dinner. I like the beans very much, like my whole family. Since we do not eat meat, we always cook lean borsch with beans, I often make a Georgian lobio dish out of beans. In general, legumes - this is what can replace the food of animal origin, and it is good to saturate the body with proteins. I recommend this salad to everyone, I think, it is very tasty! Super, I also do this. But I still put a lot of greenery (parsley, coriander), especially in summer, from the garden. And often without mayonnaise, because the beans are poured straight out with brine. At the cottage in general an indispensable option for a quick salad, when guests come or a day of jam.